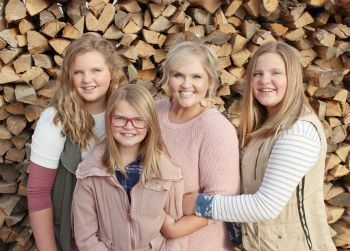 that I thought it was high time for me to finally introduce all of my readers to the crazy-talented crew behind it all. Today I wanted to have the Caravan team stop by and show & tell you FIRSTHAND about their flippin' awesome Thanksgiving products, instead of me just blabbing on about them. ha! 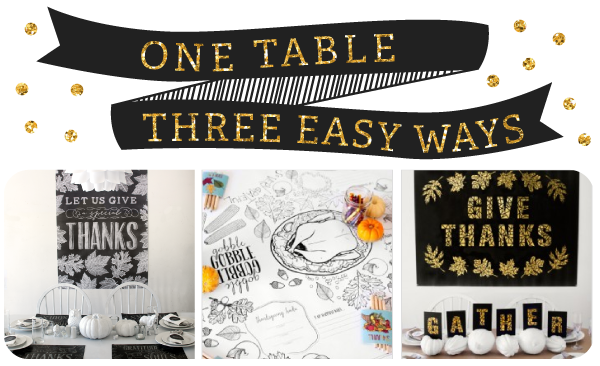 So they've come up with the genius idea of working a Thanksgiving table three different ways! PS: Remember, that these prints take minutes to purchase, download and send to your local print store (like Staples). Even if you see these ideas the day before Thanksgiving, all of them are still 100% doable, with no stress. Oh! And use discount code "houseofsmiths20" at checkout to get 20% off of your total purchase! Thanksgiving is less than two weeks away. This week will be full of grand plans. Visions of handcrafted marzipan cornucopia centerpieces, counters full of desserts with five word names (salted caramel pumpkin chocolate cupcakes with cream cheese cinnamon frosting, anyone?) and children playing happily and peacefully with the latest Pinterest-inspired Thanksgiving day quiet time activity. It all seems so perfect. And then the week of Thanksgiving actually befalls us. The centerpiece ends up looking like a five-years-old’s first attempt at play dough. The over-the-top desserts seemed nice in theory but they all taste like a train wreck of fall flavors. And finally, the kids took five minutes to rip apart the quiet time pilgrim puppets you spent three hours cutting and gluing together. Forget the over-the-top centerpiece, return to your tried-and-true pumpkin pie recipe, turn on Charlie Brown’s Thanksgiving for the kids. And please, please do yourself the enormous favor of taking the easy way out while decorating your table. It'll look like you spent hours putting the party together, when in fact these table settings will come together with practically no more effort than a Mary Poppin’s snap of your fingers. Any informal and exuberant gathering. 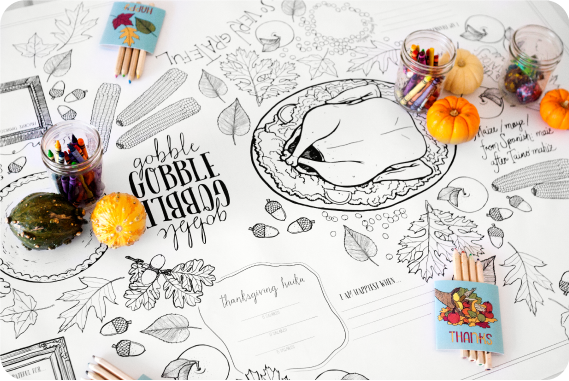 The illustrations and designs break the ice and bring out the kid in anyone who has ever wanted to draw all over the table. Ahem, you know, all of us. And of course, this is a shoo-in for the kids’ table. 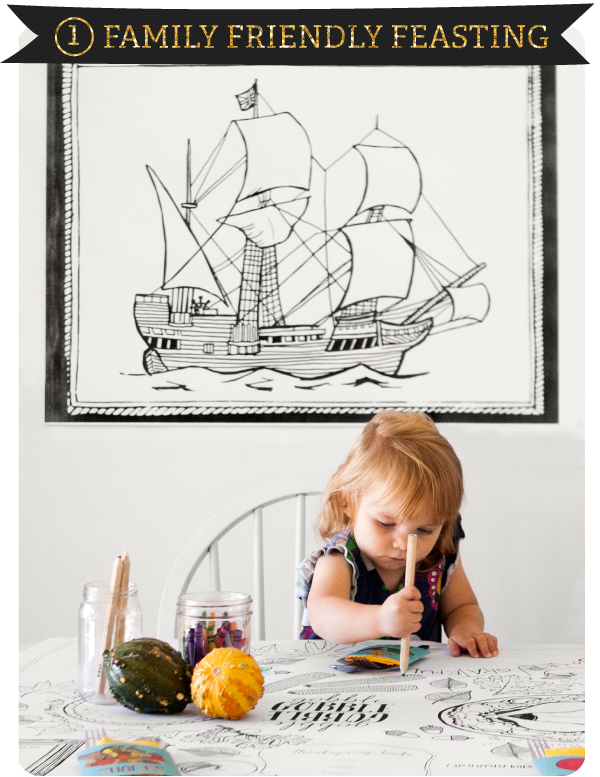 - large black and white illustrations to hang on wall. 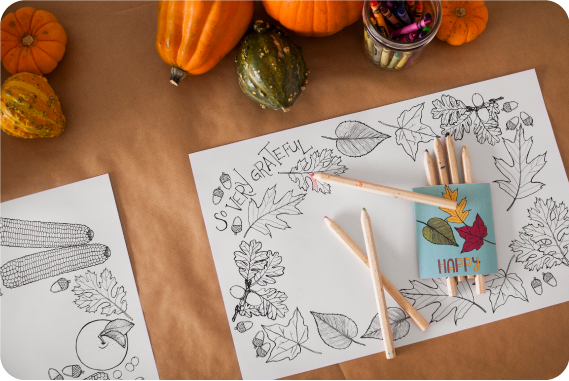 This are perfect used as oversized coloring pages. 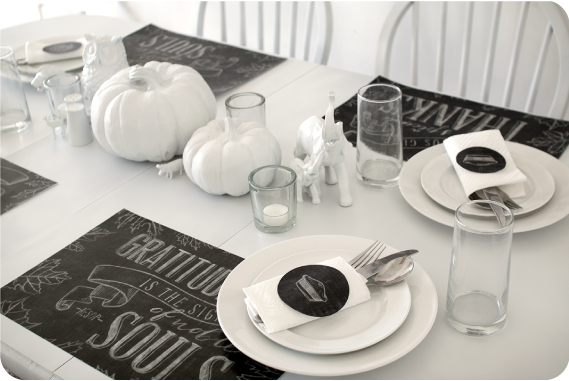 The large black and white table covering and placemats are fun and encourage interaction and conversation. Finally, a table setting that works for adults and kids! So simple you won’t know why you’ve ever done anything else. 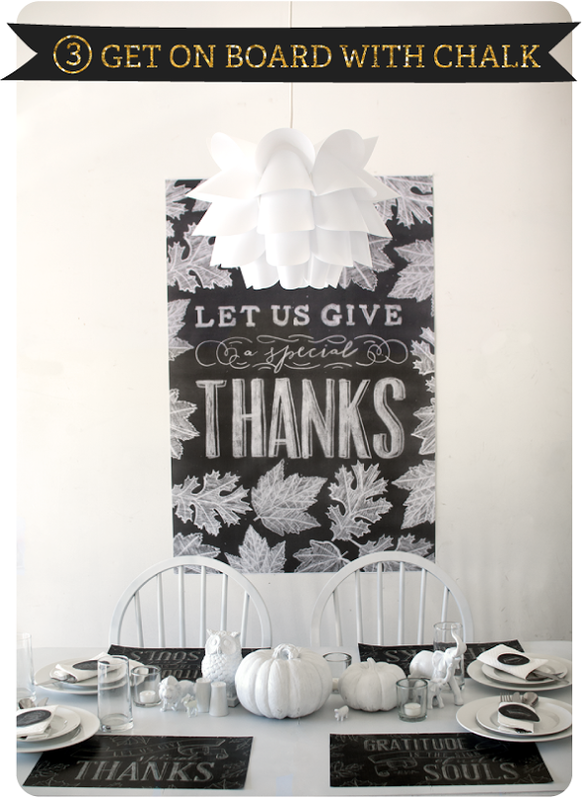 Print out the huge table covering ($7 per 3’ x 4’ print at Staples) OR print placemats. If using placemats, cover your table with butcher paper and tape the placemats over it with washi tape. Make simple throw-together centerpieces out of fall colors with decorative pumpkins and gourds. Yellow napkins look lovely in the napkin holders. Make sure to have plenty of crayons and colored pencils on hand. 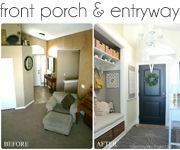 Your guests are going to LOVE this. Remember to take pictures of all their table-drawn creations before you clean up for the night. Black and white posters print at $7 or less at Staples (for 3 x 4-foot). Napkin holders print in color 2/page (do on your home printer, or plan on about $1/sheet at a print shop). Placemats print at 11 x 17 in black and white at 15-50 cents each. A formal, intimate gathering. 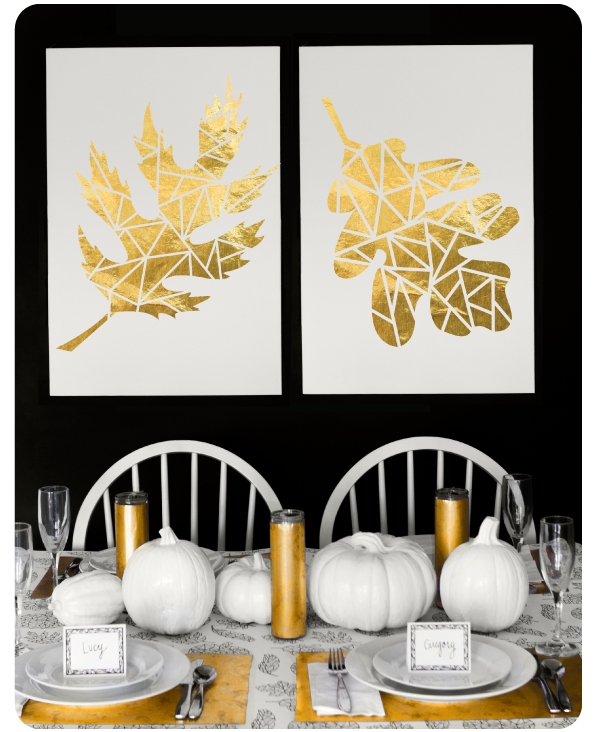 This glam approach to table decorating is also the perfect way to set the grownup table off from the kids’ table. This design takes a little more preparation. The large posters and banners need some xacto work and assembly. 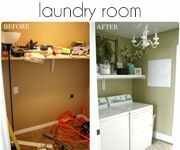 Just sit down in front of a couple episodes of The Mindy Project and cut away! Finally, a good excuse to watch some quality network TV. 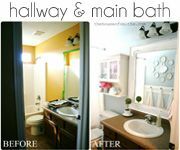 Once you are done, you have high impact—glamorous—design with little time and little money out of pocket. And? You'll be able to store it all and use it again next year. 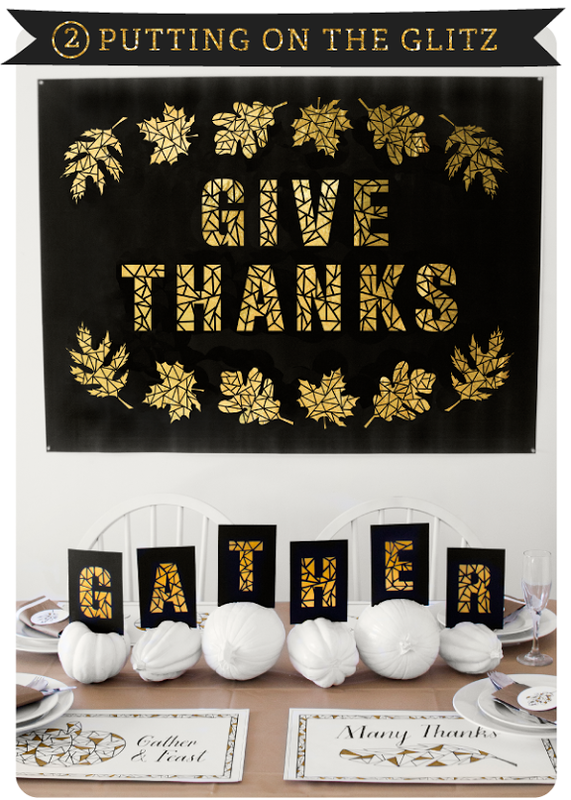 The placemats are cheap to print and adding a bit of shine with a gold Sharpie marker is as easy as 1...2….that’s it. Didn’t even need to get to 3. A gold table cloth, jewel tone serving dishes, and a smile. Black and white posters print at $7 each. The wrapping paper used to back them came in around $4. And the placemats are just about 15 - 50 cents each plus a $2 gold sharpie marker. Any size gathering. 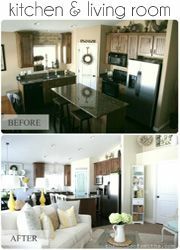 Large focal pieces and inexpensive placemats are the perfect way to add impactful style to any room. The black and white color scheme is a nod to the formality of the gathering while the illustrations and quotes add just the right touch of whimsy. 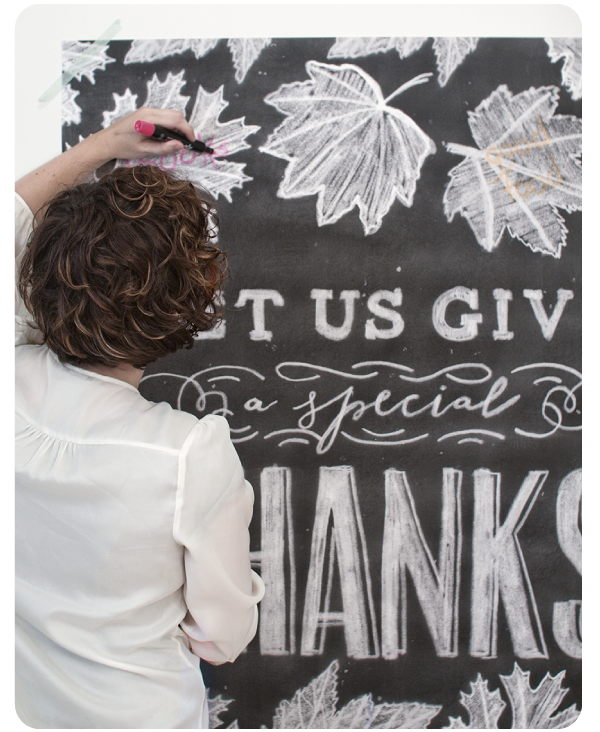 The large poster with leaves is the perfect place for guests to write down the things that make them grateful this holiday season. 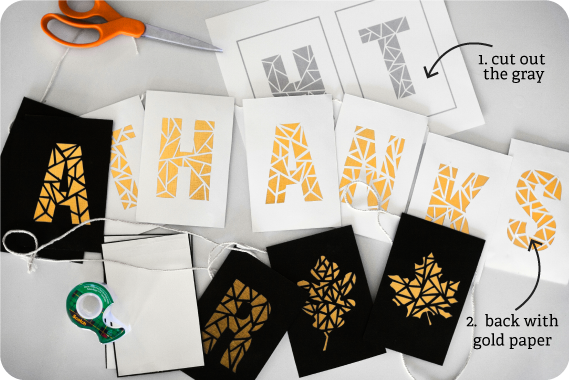 The printable stickers are a fun touch for napkin holders, goodies bags and the kid’s table. 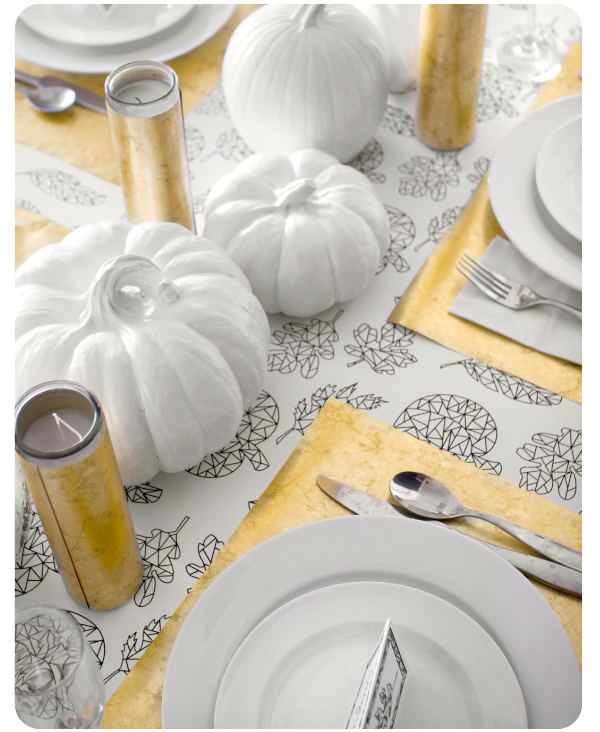 Bring color in with decorative gourds, pumpkins and your favorite patterned serving dishes. Your Grandma’s depression glass gravy boat will shimmer and shine next to the chalk table settings. As well it should. 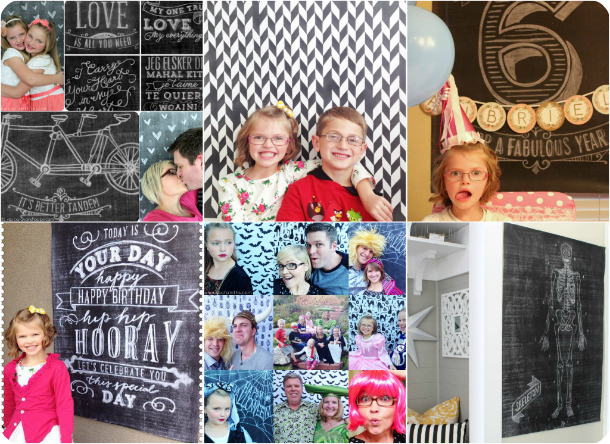 Black and white printing is shockingly inexpensive. The whole concept will come together for less than you spent your last pair of kids’ shoes. Posters print for $7 each at your local Staples. Placemats will cost 15 - 50 cents each. Print on 11 x 17 at a local copy shop, on the black and white printer. And there you have it. A magazine-worthy Thanksgiving with all the effort it takes to well, sit down and read a magazine. I found them through an instagram post you did about the ollie blocks and they are amazing! I ordered the draw together set yesterday and seriously, genius. Making me feel so much better about hosting my first Thanksgiving with lots of nieces and nephews! I hope they do one for Christmas as well!